Were there two plans of salvation in the Bible? 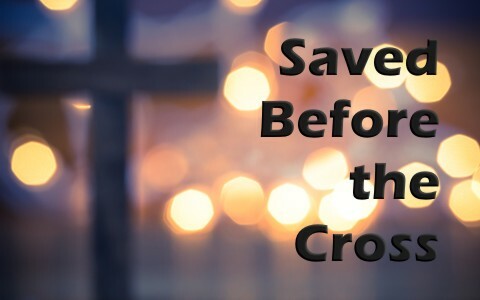 How were people saved before Jesus died on the cross? No one can ever merit their own salvation. In fact, it is impossible to redeem our own selves by works, but Christians should already know this since the Apostle Paul wrote, “For by grace you have been saved through faith. And this is not your own doing; it is the gift of God, not a result of works, so that no one may boast” (Eph 2:8-9). If you think about it, that’s good news, because if our salvation depended on our works (which it doesn’t), we’d never have any peace about just how many good works were required and if they were enough to get us into the kingdom, but thankfully, we’re saved simply by God’s grace and it’s a free gift of God, and no one can earn what is a gift. If you had a birthday party and people brought gifts for you, could you (or I) actually claim that we earned it? Did we really have any control over our being born or when? No, this was beyond our control. In the same way, no one earns their salvation, otherwise we could boast, and knowing human nature, we would! If we ever tried to keep the law with the intent of being saved, we’d end up in the same place that most of the world’s religions would be; working for our salvation but never earning it. Besides, keeping the law can’t save anyone, especially given the fact that none of us can ever keep it. It’s humanly impossible to keep the law. Paul asks a rhetorical question of the Galatians, writing “Let me ask you only this: Did you receive the Spirit by works of the law or by hearing with faith” (Gal 3:2), and “Does he who supplies the Spirit to you and works miracles among you do so by works of the law, or by hearing with faith” (Gal 3:5)? Obviously, the answer is no, because “…Abraham believed God, and it was counted to him as righteousness” (Gal 3:6). In fact, Abraham was saved before the law ever came into existence, so Abraham was justified because He believed God. To emphasize this point, Paul adds, “it is those of faith who are the sons of Abraham. And the Scripture, foreseeing that God would justify the Gentiles by faith, preached the gospel beforehand to Abraham, saying, ‘In you shall all the nations be blessed.’ So then, those who are of faith are blessed along with Abraham, the man of faith” (Gal 3:7-9). Did you catch that? The gospel was preached to Abraham and what was this gospel? The author of Hebrews writes that it was “By faith Abraham, when he was tested, offered up Isaac, and he who had received the promises was in the act of offering up his only son, of whom it was said, ‘Through Isaac shall your offspring be named’” (Heb 11:17-18). Abraham must have trusted God enough to even take his own son Isaac’s life because he knew “God was able even to raise him from the dead, from which, figuratively speaking, he did receive him back” (Heb 11:19), and of course, God could do that. Abraham trusted God, and so it was “By faith Abraham obeyed when he was called to go out to a place that he was to receive as an inheritance. And he went out, not knowing where he was going” (Heb 11:8). Imagine that! God called Abraham (Abram at the time) to go to a place he had never seen before and leave everything familiar to him. He would leave most of his family, his friends, his old pagan worship, his old city/state, his own work…to go to a place he knew nothing about. Abraham’s call came out of nowhere from a God he knew nothing about, but here is why Abraham was justified by faith. It says, “the Lord said to Abram, ‘Go from your country and your kindred and your father’s house to the land that I will show you. And I will make of you a great nation, and I will bless you and make your name great, so that you will be a blessing’” (Gen 12:1-2). What was Abraham’s reaction? Did he stop to think about it or talk about it with his family? No, it only says, “Abram went, as the Lord had told him” (Gen 12:4a). Abraham believed God and it was accounted to him as righteousness. To believe God is to obey God, otherwise, it’s not a genuine faith in God. Did we believe because we figured it out? No, God brought us to repentance because it is God Who grants it (2nd Tim 2:25), so even our repentance is not from us, but neither is our belief. We cannot believe in God until God enables us to believe. It would be like asking Lazarus to wiggle his little toe or blink an eye and Jesus would do the rest in raising him from the dead. Of course Lazarus couldn’t have raised himself from the dead, because like him, we were all dead in our sins before we were saved and dead men don’t walk or talk. They must be quickened or made alive by the Spirit of God. Unless God had intervened, we’d be on the road to hell. Paul explains that “you were dead in the trespasses and sins in which you once walked, following the course of this world, following the prince of the power of the air, the spirit that is now at work in the sons of disobedience” (Eph 2:1-2), so “even when we were dead in our trespasses, made us alive together with Christ—by grace you have been saved” (Eph 2:5), so again Paul reminds us, “this is not your own doing; it is the gift of God” (Eph 2:8). That’s why God’s grace is so amazing. He gives us what we don’t deserve and we call it grace, but withholds His righteous wrath that we do deserve, and we call that mercy. People were saved before the cross by their belief in God. Abraham believed God and God credited that to him as righteousness. Noah and his family found grace in the eyes of the Lord because Noah did what God asked him to do, so faith in Christ is a gift of God, but it’s the same way they were saved in the Old Testament. Just like Abraham, Noah, and the other saints of old, they believed God and God accounted that to them as His own righteousness. It’s the very same thing God does today (2nd Cor 5:21). Jack, after many years, I believe again. I feel that the Father is giving me faith and repentance. However, I always feel that I’m somehow not completely there. I am trusting in Jesus, but maybe I don’t have true faith. It’s a thought that bothers me a lot. I’m not sure what to do, or if I can even do anything. Perhaps I should just wait, pray, read the bible…I don’t think I have the power to do anything either way. I don’t know if what I’m saying here makes any sense. Any guidance? I see that I’ve made similar comments and that Pastor Jack and DocReits have both answered me and been very patient. I apologize for the repetition (and my poor memory). I guess I’m like a broken record. I am weak. On another note, I must say that I really appreciate this website and all the articles. It’s been a big help pointing me back to Jesus. Thanks. We are all weak, broken, clay vessels my friend. I confess this to all…and to you to my brother. Thank you Jason.